So it's late fall. Thanksgiving is almost here, it's a nippy 62 degrees in Los Angeles (hey, that's nippy by local standards!) and it was dark by about 5:00 P.M. Sounds like a soup night to me! Well, tonight's soup is one from Campbell's Select Harvest line. I chose the Chicken with Egg Noodles. The nice thing about the Select Harvest line is that it features 100% natural ingredients, no MSG (should you be trying to avoid it), and the meat -- chicken, in this case -- is roasted breast. First thing that I liked is that the carrots, the celery, the noodles and the chicken chunks were huge. We're not talking about some teeny-tiny little shreds here; we are talking serious chunks. It really made the soup look homemade. 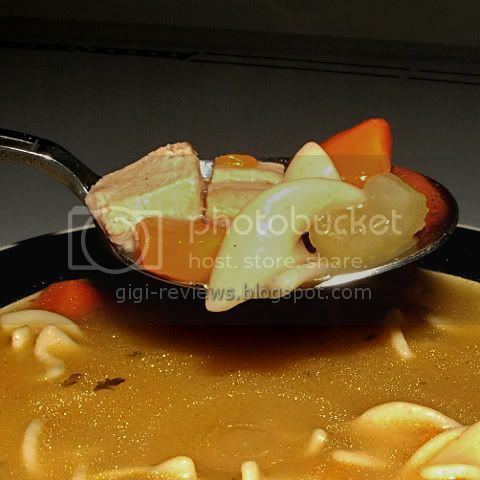 There are some other noticeable differences between this Chicken with Egg Noodles and the classic Campbell's Chicken Noodle (or even the Chunk Healthy Request Chicken Noodle). The first is the broth. It's a little thicker. The chicken also seems leaner and more like what would be found in a homemade soup. It's a little dry...but I personally like my chicken dry, so that's perfectly fine with me. The broth overall has a taste that I can best call "roasty." Yeah, there's some sage in there (or something that tastes like sage -- the ingredients list includes "spice," but it doesn't specify which ones). There's also a little onion. But the strongest flavor just seems to be essence of roast. In theory, roasted chicken -- but it's not a complex enough flavor that I could really say for sure. It overpowers everything to the point that "roasted" is really the only thing you can taste. 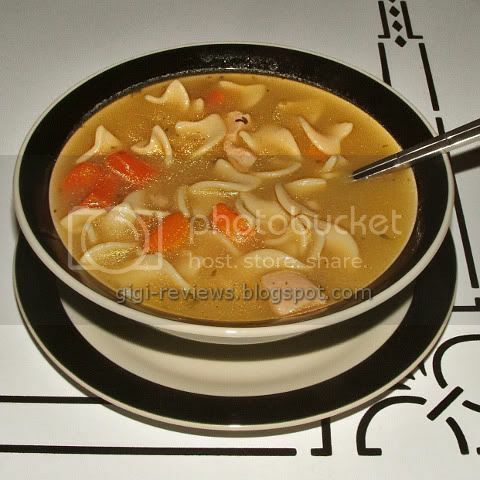 But while I really liked the big chunks and the quality of the ingredients, I can honestly say I prefer the taste of classic Chicken Noodle or the Chunky Healthy Request Chicken with Noodles. If you like that "roasty" flavor, you may love this one. Sadly, I really didn't care for it. Although you had a lot of verbiage in the prior review, you sure are wrong! 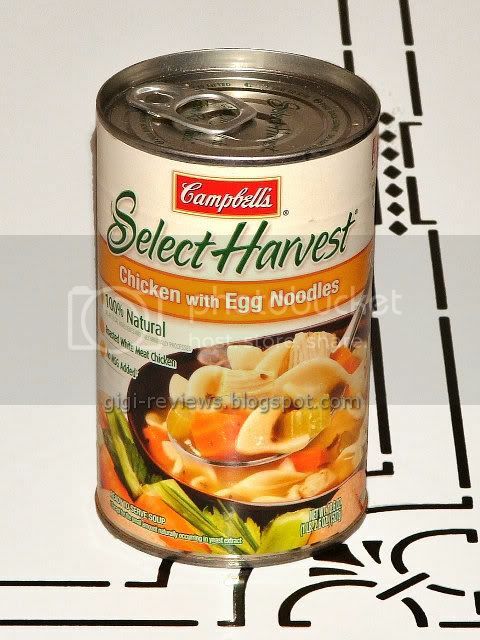 I bought some of the EXACT SAME Campbell's SELECT HARVEST CHICKEN NOODLE SOUP, ( same pic etc) but in the 15 oz individual microwaveable package and it should be named Noodles and Broth with vegetables and some token tiny mushy chicken squares, of what part of the chicken: UNKNOWN. Totally disappointed - bland bland bland, and the "Ingredients" label LIES when it lists WHITE MEAT CHICKEN as the second ingredient after CHICKEN BROTH. 'Chicken' should be listed as the last ingredient! I just finished my FIRST and now LAST can of the Campbell's SELECT HARVEST CHICKEN NOODLE SOUP, and there were 5, count 'em FIVE tiny squares of mushy chicken. So if you can't eat much chicken, this is the soup for you! Steve: It's always interesting to see how things like soup may be different from one can to another. I was reading back on that review and while I did talk about how the chunks in my can were pretty big (and as you can see from the photos they were) I didn't mention how much chicken was actually in the can. Since I wrote that roughly a year and a half ago damned if I can remember. Overall though, I wasn't even a huge fan of the soup (which is why it only got a 3) so I can't say that I disagree with you.